The Golden Temple of Dambulla is an important Buddhist shrine and monastery. 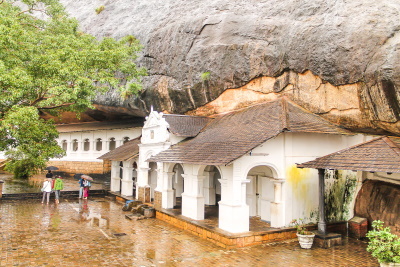 Dambulla has been a sacred place since the second century BC. It has earned the name Golden Temple because of its gilded interior. The temple consists of 5 separate caves that are hewn from a big rock. The caves were originally used as hiding places. Later on in history they were embellished more and more by several kings. On the inside, the caves are decorated with religious and secular paintings from the 15th and 16th century. The most remarkable sights at the scene are the 157 wonderful buddhist (and also hindu) statues inside. Among them is a 15 m long reclining Buddha. Dambulla is one of the numerous attractions of Sri Lanka, but not the most impressive one (neighbouring Sigiriya is the no. 1 contender for that). This site was such a surprise - in a completely positive way. I didn't know too much about it beforehand and didn't expect the caves of statues to be so beautiful and inspiring. The design is wonderful and it's such an interesting bit of Buddhist history. 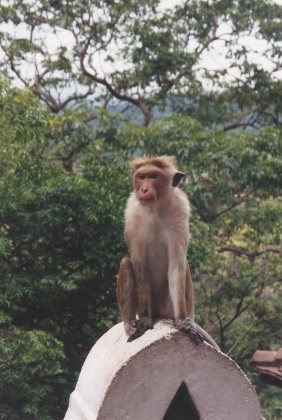 The climb up to the caves can be a little steep at points and there are some quite violent monkeys along the way. But once you're at the top you can easily spend an hour or two looking at everything and exploring the different caves. There's a peaceful atmosphere up the top to rest and let it all sink in. After reviewed Ellora, Ajanta and Elephanta Caves, I felt oblige to write a review on Dambulla, another World Heritage listed cave temple in South Asia, which maybe the most unique in the whole group in many senses. The first thing I saw at Dambulla was the new multi-stories temple of Dambulla and the gigantic but ugly big golden Buddha on the top of the building. I did not understand as Sri Lanka had many beautiful Buddha images, but at Dambulla which should be one of the most important place to Sri Lankan art did such a disappointing thing. And I not surprised as nobody seemed to care the new temple and directly walked to the hill behind where the real Dambulla located. As in the morning I visited Sigiriya and was very tired from climbing, when I saw that I had to climb the hill again I felt very discouraged at first but decided to keep going. Along the way I saw many monkeys and the views were quite stunning, I even saw Sigiriya from here. To my relief the temple was not on the top of the hill but located in the lower shelf. I felt that Dambulla landscape has many similarities with Ajanta, but much smaller and greener. When I reached the caves I saw a nice row of white porticos and verandas built in European Style as gates to the caves with lovely lilies ponds. I saw all five caves of Dambulla, the most outstanding feature of the caves were the vivid color of statues and mural paintings. The paintings were really stunning almost like ancient wallpaper. The numerous Buddha statues were equally impressive with many rock-hewn and wooden images. The colorful of Dambulla made me able to imagine how Ajanta should be when in its zenith as well as other caves in Ellora. Although the caves were great, I did not felt Dambulla to be the best site in Sri Lanka, the mural paintings at Sigiriya was much more interesting to me with more artistic and free from holy theme. But it was a great place to study Buddhist iconography in Sri Lanka better than Anuradhapura and in the same league with Gal Vihara of Polonnaruwa. Also in my opinion Dambulla was a prototype of many cave temples in Southeast Asia especially in Thailand and Laos which Sri Lankan Buddhist monastic school still hold strong influence, so visiting Dambulla was not just a local art study but also Southeast Asia art history study. Been to Dambulla Rock Temple/ Golden Temple on 31st July 2010. Besides the unbelievable craftsmanship, the temple has so much serenity, calmness and peace that as soon as I entered the temple inside where reclining Buddha is, I said "WOW" to myself. Enjoyed the climb to the temple as the surrounding is lush gorgeous green with Sigiriya at a distance. Inside the temple, the series of statues of Buddha, each one carved beautifully and the painting on the ceiling is stunningly breathtaking. Went to Sigiriya also where you have to climb 1222 steps however, nothing to beat Rock temple. It would be good if somebody can direct at the entrance only that foreigners have to buy ticket, it would have saved climbing two times up to quite a distance, however enjoyed this too as the weather was very good with slight rains.A memorable experience. I am impressed by the upkeep of the temple- absolutely clean. Sri Lanka must be the easiest country in the world to tick off all the WHSs! The temples of Dambulla are lovely and a work of exceptional craftsmanship. They are a must see for anyone in the area. It is just a shame that the temples are not included on the cultural triange ticket. Actually if you are going to vist Sri Lanka it is a placethat u want miss.Be there open to all..No matter of religon.....After visiting it enjoy with fresh fruits..,Local delicasy...People are very friendly there.. I visit Dambulla,very often,sometimes twice per year. Always see something more beautiful,and more rewarding. The climb is easy,if taken in stride,done early morning and late afternoon. But it is also fun to do it ,in the hot sun,maybe use a hat or umbrella or enjoy the glorious sweat. It can stir the imagination,of how many centuries the people here,looked from the great rock and what they saw and thought. Only a tiny fraction is reflected in the visible ,tangible evidence they left. We have to reconstruct the rest ,from the adjoining areas,and the clues left there. This makes the story more complete,and leave a lot for the imagination to complete. The charge for the cutural triangle,is affordable,and when compared with any museum in the world,can anything offer this variety,quality and quantity ,all at the same time. Most visitors spend only a day or two. But to rally grasp it,appreciate the value,it takes much more and often a week,in the open air museum of the historical places of Sri Lanka,is not sufficient. but we have to the best,with the time and resources available to us. The climb (long, but not arduous) was exciting due to the monkeys playing beside the paths. The surrounding scenery is gorgeous, with views of Sigiriya in the distance. 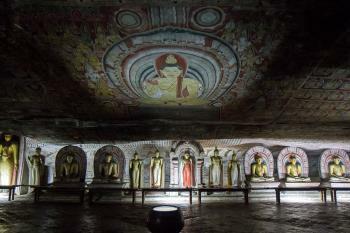 The cave temples are stunning examples of Buddhist art. The caves are virtually a chronological history of ancient Sri Lankan art, beginning with the first cave which dates to the 1st or 2nd century BCE. The successive caves go through the next many centuries up to about the 15th or 16th century. The paintings and statuary are among the most beautiful in the world of this type. The ceiling painting are so detailed that they appear to be fine cloth billowing overhead. There is a rock cistern that catches water dripping from the ceiling, but it never fills up or overflows. Fascinating experience.